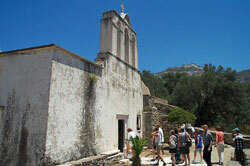 The central thoroughfare which is the backbone of the road network in Naxos starts in Hora. At first it cuts across the area of Livadi, the large plain, south of Hora. At the first crossroads, turning to the right, the road leads to Pirgaki and Halki, whereas at the second crossroads to the left leads to Halki and Filoti. The road passes through the village of Galanado (6 km from Hora) and close to the Belonia tower, which was built in 1250 as a country house for a Venetian Lord who lived in the area. Moving on we come to the village of Sangri on our right (11 km) built on a fertile plateau. The road leads to the village and then continues to the ancient temple in Giroulas - a place where sacred rites were performed, in honour of the goddess Demeter. The sanctuary of Giroula, one of the most important monuments on the island, was built entirely out of white marble (the roof included). 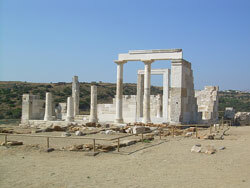 There is evidence of a direct connection between the sanctuary of Giroula and the Eleusinian mysteries. Restoration of the temple has been completed and it is now used as a museum exhibition area. After Sangri the main passes by the fortified monastery of Timios Stavros (or, as it is known today, the Tower of Bazeos) which has been recently restored and hosts a range of cultural events. From this point, the rather bumpy country road begins, leading to the beach at Agiassos. Carrying on, the road cuts across the Tragea plain, situated in the centre of Naxos; one of its most fertile areas, with huge olive groves, which are typical of the area. 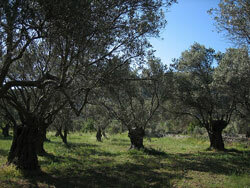 In these olives groves there are some trees which have been around for a millennium approximately. Halki, in the centre of the plain, is the main village and the administrative centre of the second largest council area in Naxos, Drimalia. Until recently it was the commercial centre of the whole island. The beautiful houses provide evidence for the town’s earlier prosperity: this is small lordly township, which has its own important market. Around Halki, surrounded by rich vegetation stand the villages of Tragea: Kaloxilos, Akadimoi, Kerami, Metohi, Himaros, Tsikalario, Monitsia (Rahi), Damarionas, and Damalas. The surrounding area is known as «Little Mistras» because of the large number of churches dating from the 6th century to the 14th century some containing impressive murals. Scattered around the plain are the following Byzantine churches: Panayia Protothroni (9th to 10th cen­tury), Agios Giorgios Diasoritis (11th century) in Halki (built according to archaeologists over of the ancient temples of Apollo and Zeus); Panayia Damiotissa (11th century) in Kaloxilo, Panayia Drosiani (6th century) close to the road towards the village of Moni. In the area of Tragea there are Venetian monuments such as the Gratsia tower in Halki, the tower of Makropoliti- Papadaki, at Akadimoi, and the Apano castle, near Tsikalario where remains from the ancient, Byzantine and Venetian times can be seen. Apart from the historical monuments it is also worth visiting this area for the traditional citron distillery in Halki and the restored oil press in Damalas.